U.S. and Canada’s top pay-TV service providers are bringing back fan favorite Santa Tracker, inviting their viewers to celebrate the holiday season with an interactive, Christmas holiday-themed programming experience, powered by zone·tv™. Families can once again come together to enjoy holiday themed fun features and track Santa’s path across the globe on Christmas Eve. This highly engaging TV experience is available, free of charge, in over 72% of TV homes with kids nationwide. 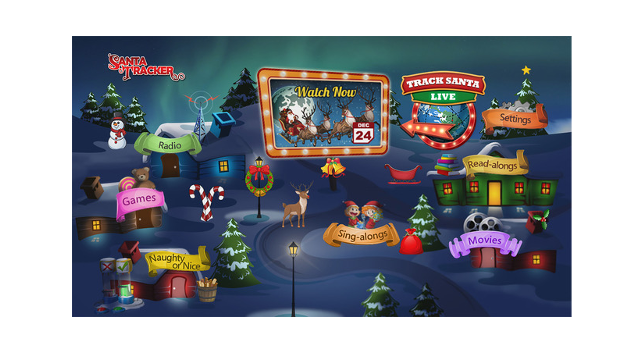 Santa Tracker’s exciting, unique and festive features bring viewers together, enjoying over thirty minutes every time they start the experience from the channel guide, voice command and apps menu on their pay-TV service. As a 2018 Banff World Media Festival finalist for “Interactive Program for Kids”, Santa Tracker has not only proven to be a holiday favorite for subscribers but has also proven to drive value to both pay-TV providers and advertisers. The Santa Tracker experience directly links to the pay-TV providers Video-on-Demand libraries, and providers see a significant increase in VOD title rentals resulting in increased revenue. For advertisers, Santa Tracker creates an immersive experience that provides several types of advertising and sponsorship opportunities including banner, product placement, interactive and video ads. Santa Tracker can be found on Comcast Xfinity X1 in the kids and holiday sections of Xfinity on Demand and in the app menu. Customers with an X1 voice remote can say “Santa Tracker” to launch the destination. Santa Tracker is also available on AT&T U-verse on channels 1098/ 324/ 1324; DIRECTV on channel 110; Frontier Communications channels 266/ 346/ 1326/ 98 depending on location; and CenturyLink channels 91/ 1091. In Canada, Santa Tracker can be enjoyed through the TELUS channels 610/12; TELUS Quebec 501/ 514; Bell Canada channels 149/ 540/ 1149/ 1540/ 1212; Bell Atlantic channels 456/ 513/ 559; and on Bell MTS channels 82/182.